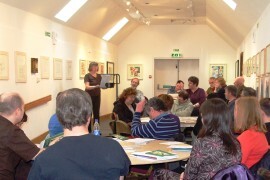 The 2009 anthology of the Lemon Tree Writers was launched at Woodend Barn, Banchory, on May 9th 2009. Twenty three people attended the event. Robert Ramsay, the co-ordinator of the project, introduced the theme using gems of apposite literary illustrations. Then followed a cascade of readings from the anthology, verse following prose, giving depth and dimension to the theme. The theme "Journeys" evoked many different memories and symbolic references for the authors. Haunting memories of childhood journeys were turned into evocative poetry. Journeys full of fear were evoked, and fears absolved. Journeys which took the audience to the furthest parts of the world, the Americas, Africa, China. Journeys were also portrayed as inward travel, allowing for personal growth and the confrontation of doubts and fears — themes handled by poets and prose writers. Some of the authors had written stories very much rooted in modern society with modern themes. These pieces were much enjoyed by the audience, as the stories asked for empathy. Other stories and poems were located in the past, a poignant resonance coming down the years. The audience were left with a feeling that, from childhood to old age, we people of all sorts, are going on a meaningful journey. This sense of meaningfulness was captured in these short pieces and poems, to the delight of the audience. The co-ordinator of the project declared that the anthology Journeys is now on sale for £4 a copy. He hopes you all enjoy reading it.